IT’S FRIDAY! That time of week where we all look forward to what the weekend brings and we look forward to uploading our blog. – And how do we like to get our blog started? With a Mantra for Motivation! And in spirit of our new Mantra, let’s look at some inspiration – NEW SPRING SUMMER STYLES FOR 2016. But this isn’t a clothing blog.. is it? 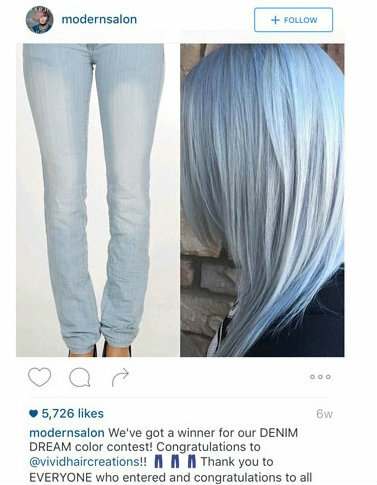 Nope, we’re talking about the denim style hair! The denim trend is all about getting our hair as close to denim colours as possible, some are extravagant, some a little less! A company called ‘Modern Salon’ have even hosted an instagram contest (now closed) called ‘Denim Dream’. Take a look at their winners post below! HALT.. let’s not be too quick to hover past this post with panicking thoughts of ‘being a walking learning platform for children who are learning the colours of the rainbow.’ It’s okay to be a little wild, infact we encourage it, especially for those festival seasons! With the right stylist (all of whom can be found at TH1 ;)) it can look great! Well, what exactly is the ‘Rainbow Hair’? It’s a trend brought back from the early 2000’s featuring underlights in the hair. This time.. we have a little addition – rainbow tips too! Maybe you want some colour but a little more subtle? We have new colours in the salon called our ‘Instamatic range’ – I personally love love love pastels in the hair, especially for spring/summer time! My favourite is seeing them feather’d throughout the hair.. What’s your favourite way of wearing pastels? We understand that spontaneity doesn’t mean we need to completely revamp our hair style & colour. For those of us who prefer a more subtle look, (myself included) how about something less bold but bold enough? How can you possibly stretch my roots?! Fake roots of course. Choose a complimentary root colour enhancing your natural features and choose whichever colour hair you desire. Now, oftenly mistaken for ombre, this little technique is perfect for those of us wanting that root stretch but a little more blended, or that ombre but a little more subtle. And then moving on to our trending styles..
One of the most caught on styles this spring summer and has already been claimed by a few A-listers as seen..
We can finally get up with bed hair and walk straight out of doors with being able to say ‘hey..it’s fashion!’.. well.. not quite, there’s a little more too it than that..
A recurring fashion statement we’re seeing this year for our hair are accessories! Why should your hair not be fully dressed too, right? Well surely this doesn’t apply to me! I have fine blonde naturally pin straight hair.. oh no no, how wonderfully wrong you are.. we have one word for you PERM. Take a look on this updated version of the perm creating fake fro’s or look at these naturally beautiful ones too! Clean and classy, the blunt cut is massively in this year! Why not match it with the ‘Breezy Blow Out’?